WASHINGTON—U.S. 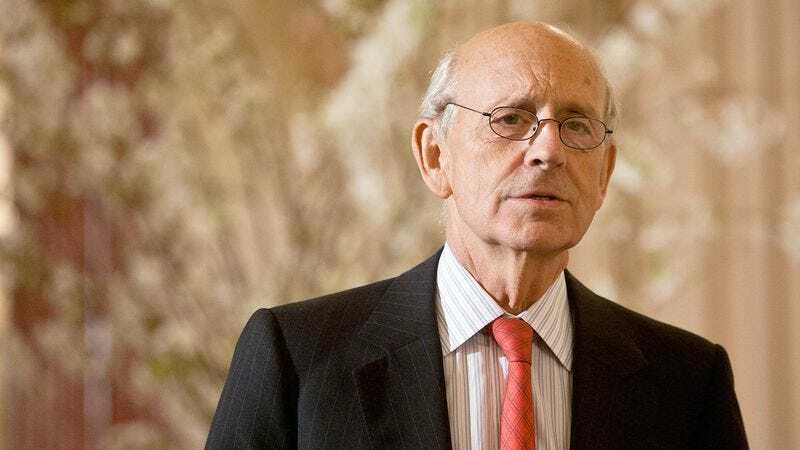 Supreme Court justice Stephen Breyer told reporters this week that he cannot stop himself from deliberating over whether even the most mundane aspects of his personal life follow the dictates set out by the U.S. Constitution. "It's completely automatic now; without even thinking about it, I'll be staring at a cup of coffee and start mentally running through Third Circuit appeals that could potentially relate to it," said Breyer, who estimated he spent at least six hours of his free time Saturday contemplating the constitutionality of issues ranging from throwing garbage in a neighbor's trash can to a birthday card for his nephew, which certain creative property statutes might have applied to. "I was late to work this morning because I tried to figure out whether borrowing my wife's car would violate the Fourth Amendment's prohibitions on unreasonable seizure in light of the precedent set by—hold on, I should be writing this down." When reached for comment, the Supreme Court's other eight justices were unanimous in their sentiment that Breyer should really stop calling them at home.